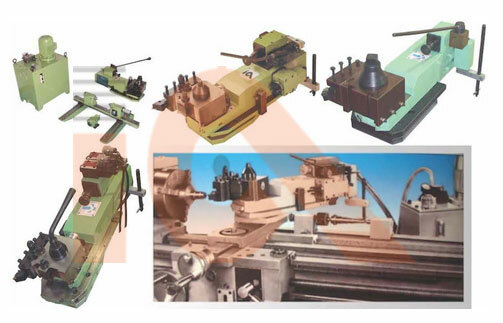 Copy Turning Lathe Servo Turn Hydraulic tracers have been used in one form or another for well over many years. A hydraulic tracer enables someone to follow a template and precisely control the movement of hydraulic cylinders. This creates an exact 1:1 duplication from the template to the travel path of the cylinders. This is especially useful when there is a requirement for a large quantity of the same part. It is a simple process, which avoids the necessity of computers and programs. This simplicity makes it easy for operators with all skill levels to operate a piece of machinery. The hydraulic tracer is suitable normally for rear mounting on center lathe, capstan lathe & Turret. This arrangement leaves the front tool post of the lathe for normal operations as usual in case any front operation is required after copying. The tracer can also be mounted on the front with certain adaptations. The tracer is provided with swivel base to fix it at a suitable angle of copying for turning Boring & facing depending on the profile to be copied. Recommended angle of copying is 60° for turning & 45° For Boring & facing generally. But other angles can be tried out depending on the nature of copying and profile. Hydraulic Copy Turning Attachment are available in four different models and these are utilized in several industries. The servo turn tracer that we offer is ideal for manually operated systems on any lathe, new or old. This machine can be easily operated by semi-skilled personnel and can be successfully mounted on the front and rear of a lathe. This machine helps with the reducing the inspection time and increases the rate of production equal to or more than 300% with an accuracy level equal to +0.025mm on good lathes. The copy valve servo turn lathe tracers are tested individually and on a stringent basis in order to facilitate a hassle free and longer service life. Stroke of tracing slide in mm. Minimum/Maximum Centre height from top of cross slide in mm. Max. Dia of round master in mm. Max. Length of master in mm. Hydraulic working pressure in kg/cm2. Recommended tool shank in mm.